Steins;Gate was a wonderful (in my opinion, anyway) visual novel. Originally released in Japan all the way back in 2009, this self-marketed “hypothetical science adventure” has made quite an impact on the visual novel scene. Boasting an unforgettable cast of characters, superb writing, and a startlingly strong connection to real-life sciences, Steins;Gate is definitely a game to remember. Oh, of course, and we can’t forget to mention the story itself! 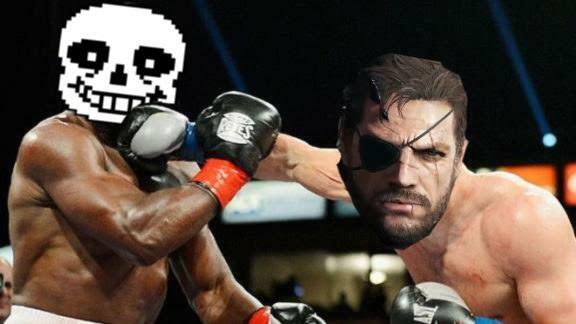 Yeah, the story… For those of you who have played the game, do you remember the True Ending? A lot of the story was pretty tense, but that last chapter was especially full of ups and downs throughout its entirety. Fortunately, despite what happened, things turned out for the best – at least it did until Steins;Gate 0 came out. Ready to shatter your perception of reality even more (and also probably be kind of sad)? Of course you are – let’s see what Steins;Gate 0 is all about. Whoa, whoa, hey there buddy, I’ve got to stop you really quick before you get too far into this review. Fair warning, Steins;Gate 0 is a direct sequel that begins partway through the Steins;Gate True End. Because of this, there are some major spoilers concerning the Steins;Gate story. 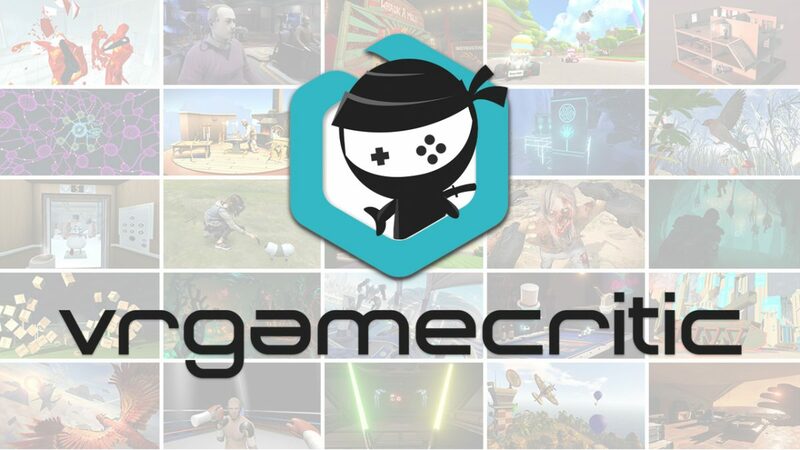 I’m also going to assume that, if you continue to read this review, you understand what happened in the first game (or just don’t care, either way). Okay, you’ve been warned, please continue! 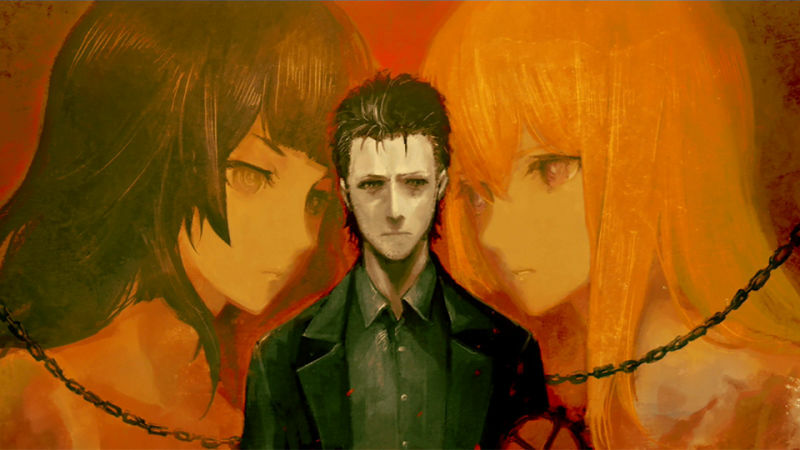 Steins;Gate 0 begins not after Steins;Gate, but rather partway through the final chapter of Steins;Gate‘s True End, when Rintaro Okabe – the protagonist of the series – accidentally kills Kurisu Makise – a super-genius and Rintaro’s love interest – while, ironically, trying to save her in an attempt prevent World War III from happening. 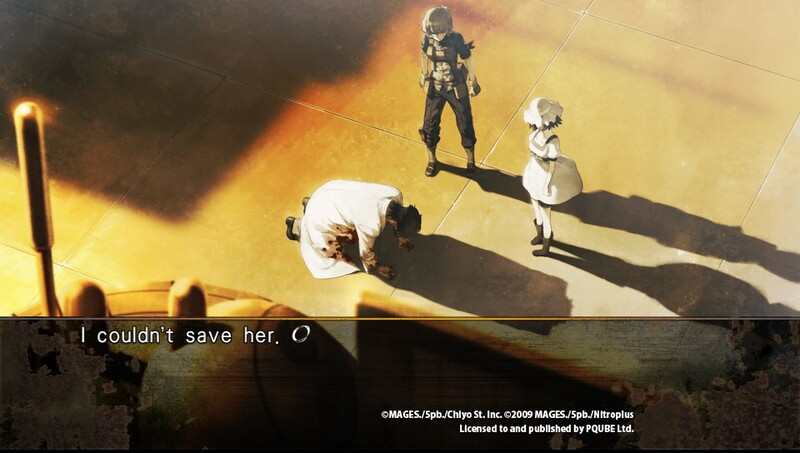 Rather than eventually gaining the courage to go back in time to attempt to save Kurisu once more, as he did in the original Steins;Gate, Rintaro completely gives up, obsessing over the thought that he cannot save Kurisu from death no matter how many times he tries and quickly falls into a deep depression. Abandoning his friends, his mission, and, perhaps most tragically of all, his chuuni-inspired alter ego Kyouma Hououin, Rintaro decides that it is for the best to give up on all of the “nonsense” (despite literally being friends with his friend’s daughter from the future), and begins focusing solely on his college education and having a “normal life” in hopes of moving on. Unfortunately, that isn’t going to happen; Kurisu may be gone, but the will of Steins;Gate (or whatever chuuni jargon Rintaro normally used to spout off) isn’t going to let Rintaro forget about her. Thanks to several events (that I won’t disclose for the sake of spoilers) falling perfectly into place, Rintaro eventually comes into possession of a program known as “Amadeus”. Amadeus is a highly-advanced program being developed by some of the world’s top scientific minds (with whom you’ll become quite familiar), that pushes the limit of what an AI (Artificial Intelligence) can do. By digitizing and downloading the thoughts of a human being, Amadeus is capable of effectively becoming its own person. Despite initially looking and acting like the person whose memories it was created from, Amadeus can end up developing a personality completely different from that its “original” depending upon events within its life – for simplicity’s sake, it is essentially like creating a twin (except the twin lives inside of a computer, I guess). In order to test Amadeus, several of the scientists opted to digitize their own thoughts so that the development of their digital selves could be studied. You don’t really need me to elaborate any further, right? You get where I’m going with this, don’t you? Yup! Kurisu just so happened to be one of the Amadeus test subjects and, wouldn’t you know it, that’s the version of Amadeus that Rintaro ends up with. Talk about piling up even more psychological trauma! Yikes! 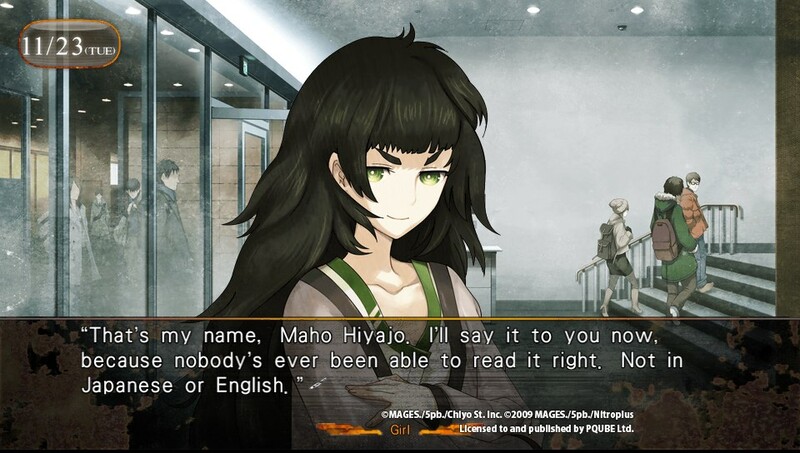 If you’ve played (and I use that word liberally) the first Steins;Gate, or pretty much any visual novel really, you should feel right at home with Steins;Gate 0. Aside from reading the story (which is what you’ll be doing about 99% of the time) the TIPS feature makes a return, allowing players to brush up on over 200 unique terms used throughout the game. 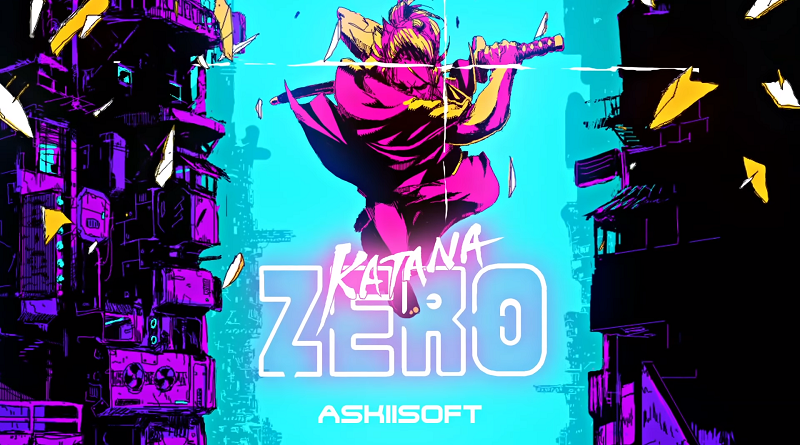 The terms listed in TIPS are once again broken up into segments, ranging anywhere form legitimate scientific processes to otaku culture, and provide much-needed explanation for many of the words and terms that pop up throughout the game. Also making a return in Steins;Gate 0 is the ability to use your phone – that may sound kind of goofy to newcomers, but you Steins;Gate pros know how important that is, I’m sure. During certain parts of the story, Rintaro will be able to make and receive phone calls and messages (via an app called RINE made by none other than Daru) on Rintaro’s nifty new smartphone. While most of the conversations seem pretty unimportant for the most part, they have the potential to majorly impact the ending as they did in the original Steins;Gate. Adding to the interactability of Steins;Gate 0 somewhat is the additional ability to use the Amadeus app to talk to Amadeus Kurisu. 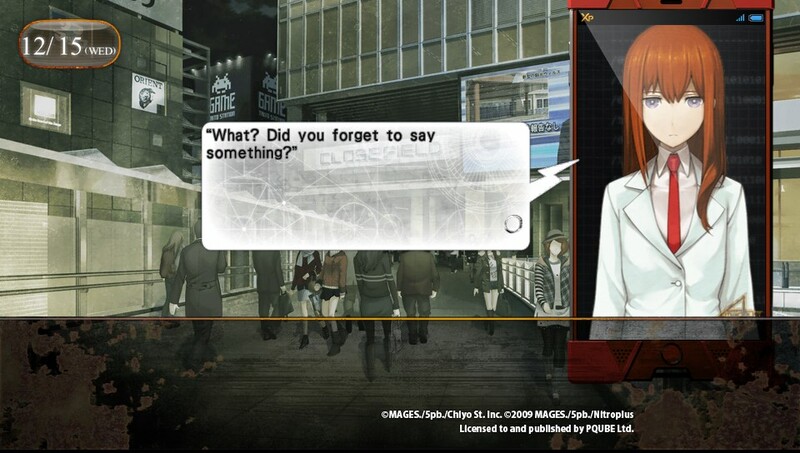 Much like how the RINE app works, the Amadeus app allows for players to contact, or in some cases purposefully not contact “Kurisu” during certain parts of the storyline. The fact that the Amadeus app is about as limited as the RINE app pretty much means that they’re the same thing, and you won’t be using either very much at all, but I appreciated the fact that they were at least split up into two separate categories for the sake of the storyline. Speaking of storyline, I would like to caution you now to not expect Steins;Gate 0 to be an experience similar to that of Steins;Gate. 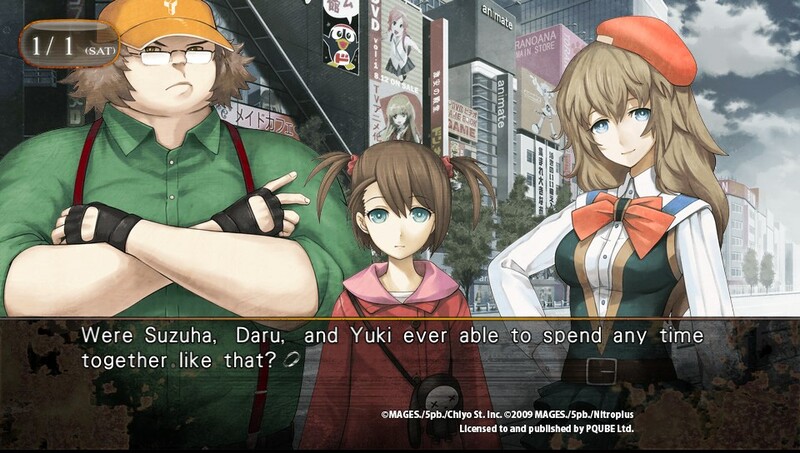 Sure, all of the characters and storytelling elements from the original Steins;Gate are there. In that case I suppose that it is a somewhat similar experience. That isn’t what I’m talking about, though. What I’m talking about are the emotional forces behind the story. Steins;Gate ended up becoming pretty serious partway through, but a lot of the game still managed to contain a noticeable amount of whimsy and wonderment. For the most part, that isn’t there in Steins;Gate 0. Rather than building a story from Rintaro’s scientific curiosity and boyish personality traits, this story is built atop Rintaro actively grieving the loss of a loved one. Although Steins;Gate 0 is definitely part of the same series, I would caution you to brace yourself for a much more heavy-handed experience. A lot of the game is built around very real, and very scary human experiences involving loss (in numerous ways), and the grieving process. It might sound kind of intimidating, and for some people I imagine that it would be, but I found the story to be quite beautiful overall. Steins;Gate 0 did a fantastic job of capturing the different struggles that we go through as the highly-emotional beings that we humans are. It was delivered it in a way that is real to the point of it having an impact on you, but never sad just for the sake of being sad. Even more importantly, Steins;Gate 0 shows that things don’t have to always have to be perfect to be okay and that those of us lucky enough to have close friends are never truly alone even when we feel that way. What always had the biggest impact on me though, was thinking to myself “man, this used to be the guy that ran around yelling about being a mad scientist” while realizing what he was now. It’s some really, really captivating writing. Phew, did it just get serious in here or what? Time to move on! Let’s talk about that Steins;Gate 0 artwork! The graphics in Steins;Gate 0 are what I would call a more “polished”, or perhaps even “HD” version of those within the original Steins;Gate. While the drawing style for the characters is the same, and the artwork still gives off that lovingly hand-drawn feel, it just felt as though things looked a little less, I don’t know, “rough”? I’m not an artist, so I don’t know that I can explain it a whole lot better than that, but it’s a compliment. Trust me. All of the characters also got new outfits, which was pretty cool as well. Steins;Gate 0 does a great job in the musical department as well, once again setting the bar for what visual novel game soundtracks should sound like. Boasting a nicely-sized track list for its genre comprised of re-made versions of Steins;Gate songs and completely new tunes, Steins;Gate 0’s score knows just how to set the mood, regardless of what is going on (although it’s probably something sad). Well, folks, there you have it. Steins;Gate 0 does a phenomenal job of living up to the original game’s successes in nearly every way. It does feature a much darker story than its predecessor, which I imagine may drive some of the more faint-of-heart away, but for those ready to delve into the next chapter of Rintaro Okabe’s life, I can pretty much guarantee that you won’t be disappointed.